Ongoing improvement can be implemented in many ways from simple discreet initiatives to well-planned high profile projects. 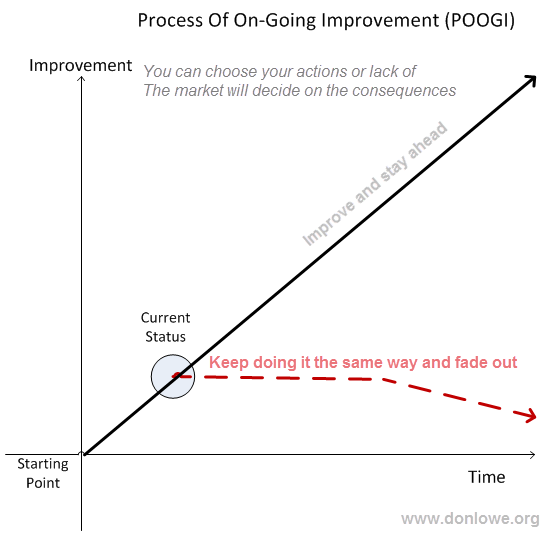 All improvement initiatives will involve change and dedicated management. We will take a look at different aspects to how organisations can implement improvements based on well researched and documented practices and thinking processes. Why do efficient and effective companies need to think in terms of continuously adapting or improving when they are successful with how they do things today? The world around us changes; other companies learn from your organisation and other competition in the market space. They in turn aspire to delivering a better product or service. What is cutting edge today is common tomorrow and obsolete the day after. You can choose to be content with where you are today and slowly fade out of the market or you can choose to stay ahead of the pack. To stay ahead you must take the right actions and decisions, you are free to choose which actions to take, your clients and their customers will decide on the consequences. We are basing this discussion on the following assumption: If your company is not improving then it is stagnating in relation to the competition and will ultimately fall behind and become irrelevant. Why do successful organisations fail? 1: The leadership of a company focuses purely on the marketplace of today to maximise short term profits and fails to anticipate the future trends and make the relevant investments for long term profits. 2: “We are the best syndrome” where the organisation, especially the leadership and quite often the employees focuses on and talk about what made them successful and fail to notice when something new is displacing it, or the deterioration in their own services due to complacency.